“Which One Doesn’t Belong?” Sounds like a simple proposal, right? When presented with a group of four similar “things,” is it truly easy to answer that question? 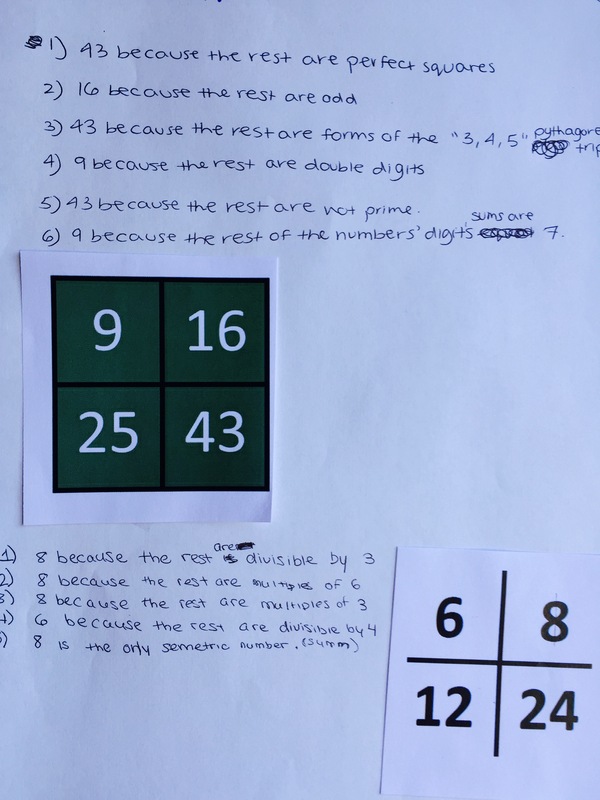 All of my amazing PLN at #MTBoS, Christopher Danielson (@Trianglemancsd), Mary Bourassa (@MaryBourassa), Alex Overwijk (@AlexOverwijk), Andrew Gael (bkdidact) and @WODBMath, as well as these sites and blog posts: WODB Website, Steve Wyborney’s Blog Post, Alex Overwijk’s Blog Post Part 1 , Alex Overwijk’s Blog Post Part 2 , and Alex Overwijk’s Blog Post Part 3. WODB seemed like a great activity to finally implement on a day that was sandwiched between a test day, and the start of a week-long vacation. I had seen the concept floating around Twitter and the Blogosphere, and really wanted to have an opportunity to try it in my own classroom. Given one period only, I introduced the concept to each class, we sang the jingle together (check out the title of this post for a hint! ), and as a whole class, we practiced on a sample foursome card: 2, 3, 9, 11. We were able to quickly ascertain that 2 doesn’t belong because it’s the only even number, 9 doesn’t belong because it’s the only composite number (as well as the only perfect square), and 11 doesn’t belong because it’s the only 2-digit number. 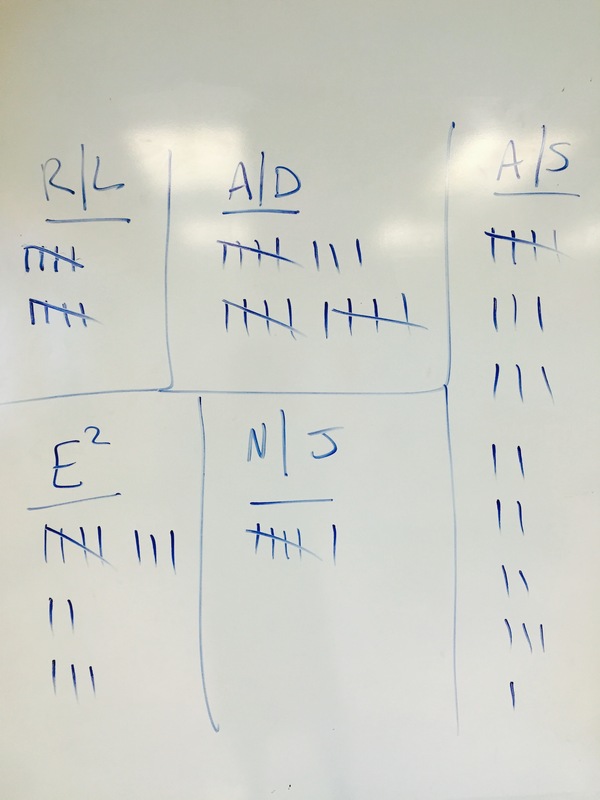 Once everyone got the hang of the activity, my students worked in partners, picked one WODB card at a time, and worked together to come up with all the possible ways one of the four things didn’t belong. Some teams came up with a couple of reasons for each foursome card, while others came up with closer to ten or twelve reasons! I allowed teams to choose more than one foursome card so they could work with different types of pictures: numbers, graphs, shapes, or other graphics. There were a few copies of each foursome card, and it was fun to see the different types of reasons each team developed. The “winner” of the challenge was the team who was able to come up with the most number of valid reasons for one foursome card. What constituted validity? At the end of the period, each team had to present their findings to the rest of the class using details, mathematical reasoning, and proper vocabulary, and as a whole class, we decided if the reason was valid. We kept a tally on the whiteboard to keep track! Some of our tally for WODB. 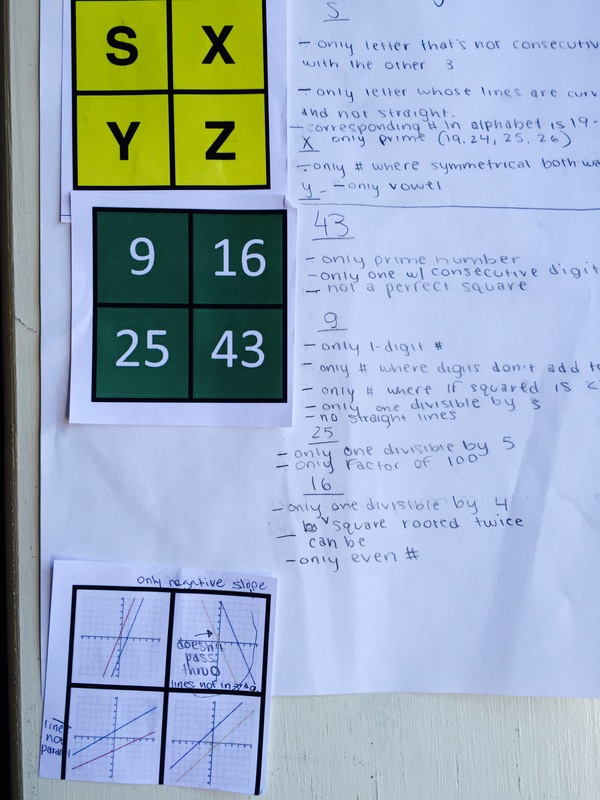 With more time, I would have had teams develop their own WODB foursome cards, and circulated them around the room so teams could practice on each other’s homemade cards. 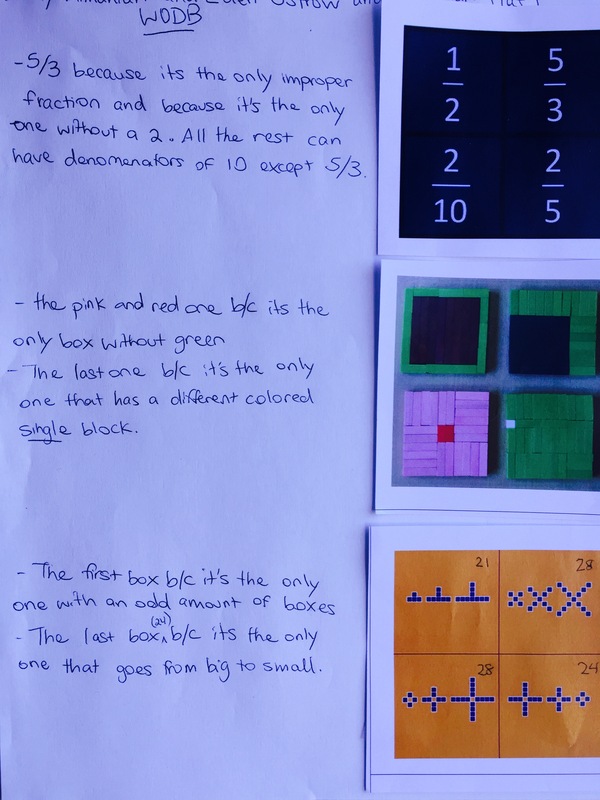 This could be a great activity to revisit in the future, now that my students are exposed to the idea of WODB. It can be used with any topic, at any grade or ability level, and in any subject area, and it exercises a host of excellent skill-sets that benefit all students. 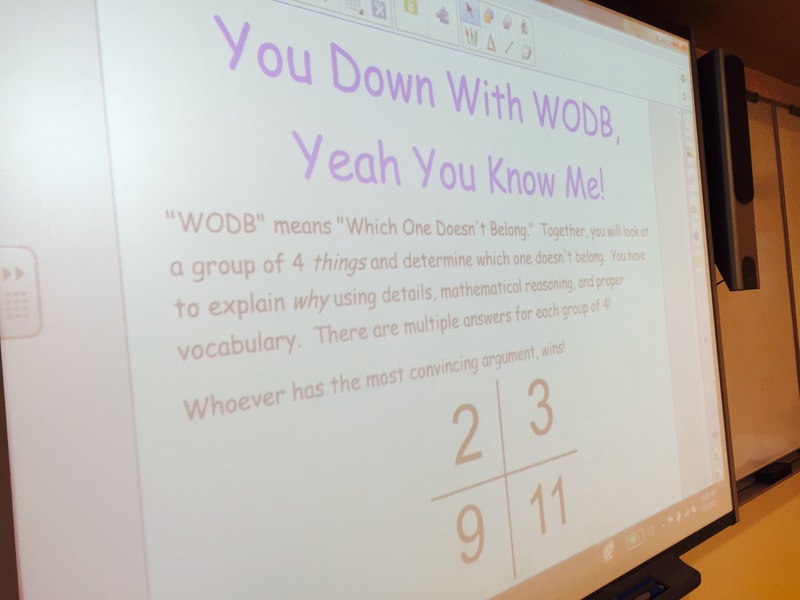 This activity is a great way to get students using math vocabulary to compare and contrast. Right now my students really enjoy this activity- so much so that “homework” for them was to create their own. I asked them to create their own WODB problem where each element has at least two reasons to be chosen. The flexibility of the question allows you to include virtually any elements to be compared, and students like trying to find the “odd one out.” I would recommend this activity for any classroom at any level. Agreed! I like the idea of your homework assignment. It does require students to use their “creative juices,” and can be differentiated to meet the needs of all learners. Thanks for the great ideas! I love this! I’m going to use this strategy soon!! Thanks! It was really fun, and can be formatted to work with any unit for any age group! Have fun and good luck! Please let me know how it goes. It could absolutely work! The whole concept of WOBD can work for any subject matter and any age. Blocks? Colors? Shapes? Foods? Animals? All great topics for PreK. Good luck! Let me know how it turns out! Thank you for the details and examples. I am particularly impressed you got your students to roll back to the early 90s and join you in song. Haha! I sing a lot in class, they love it! They love anything 80’s and 90’s. Success criteria was co-created with students, so now we can triangulate this as assessment data. Plus, it’s a wonderful demonstration of thinking using justification and a fun ‘minds on’ activity. So glad a colleague introduced me to WODB. That’s awesome! What was the success criteria your students created? Does anyone have primary examples that they wish to share? Love this idea! Feel free to use some of the examples in the pictures that I posted. Search the hashtag #WODB on twitter, or even just do a general search on the web. You can also create your own!